Nike has been a hugely influential company in the sporting world over the last number of decades. They have been involved in sports such as basketball, soccer, skateboarding, tennis, surfing and running to name a few. Nike Golf has brought the Nike brand and their famous swoosh to golf courses around the world. Sponsorship of some of the biggest names in golf has brought more attention to the company’s efforts in the world of golf. Now, their state of the art golf attire is available to amateur golfers and can help you bring your game to the next level. As a global brand, Nike captures the essence of truly functional athletic attire while maintaining style and the latest in fashion. Using a variety of colors and the latest in sporting design, the Nike Golf range has something to offer everyone, whether you play the odd weekend or you are aiming for a spot on the PGA tour. Nike Golf is the ideal choice for schools, teams, resorts, community organizations and corporate golf outings. The classy, stylish and sleek Nike Golf’s Ladies Dri-FIT Micro Pique Polo will have you looking your best from the clubhouse to the final green. Women around the world have turned to Nike to ensure that they look and play their best at their local clubs. Why not join them with this fabulous polo and stand out from the crowd not only in terms of style but in your game too. This shirt has a unique collar style giving it an extra edge over other polos in the market and has turned a classic garment into a modern, functional polo for the golf course. With a broad range of colors to choose from, the Nike Golf’s Ladies Dri-FIT Micro Pique Polo comes in a color for every taste and every season; Aluminium Pink, Antracite, Black, Blue Sapphire, Cornsilk, Fusion Pink, Lawn, Mean Green, Navy, Night Purple, Team Orange, Team Red, Tidal Blue, Valor Blue, Varsity Red and White. This wide range of colors ensures that your club, team or organization will be able to choose the most appropriate colors for you and still look your best on the course. Using the unique Dri-FIT fabric, with moisture management technology, Nike have made sure that you are donned with the most progressive materials on the market. This material will keep you free of sweat and will keep you cool and comfortable, especially during warmer weather. 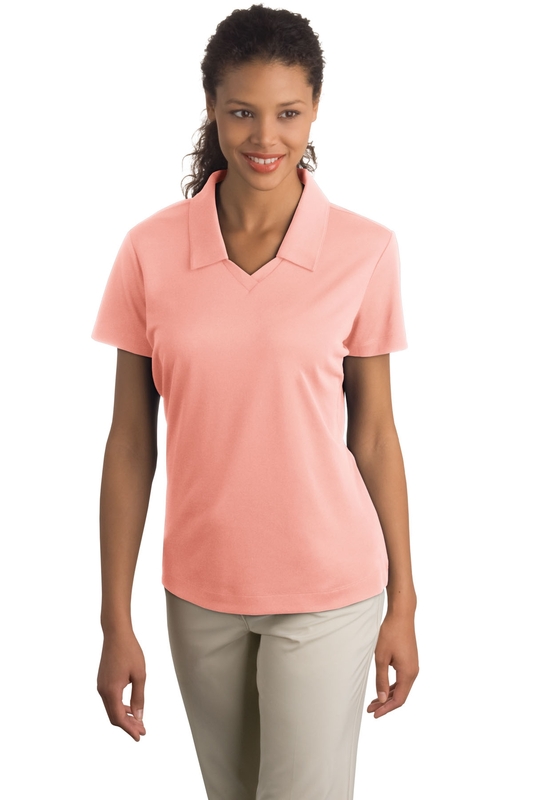 The polo has been designed with women in mind; created from 4.4ounce, 100% polyester material and tailored for the female body shape to ensure you are as comfortable as can be. Of course, the iconic Nike Swoosh trademark is subtly embroidered on the left sleeve. This stunning polo with comes in a great range of sizes. Ladies sizes are; S, M, L, XL and 2XL.